Home owners/buyers should be aware that humidity control (or moisture removal) is only a secondary benefit of standard air conditioning (i.e. moisture is only removed when the thermostat is calling for cooling). Although currently accepted HVAC load estimating methodologies attempt to maximize the moisture removal capabilities of standard air conditioning, it does not ensure satisfactory results, particularly in warm humid climates. Humidity control can be improved with controls, the use of variable speed air handlers and the use of multi-stage compressor systems. Additionally, whole-house dehumidification systems can be installed to precisely control humidity independent of the air conditioning system. Those with mold allergies, asthma or other respiratory concerns should be particularly aware of the benefits of interior humidity control. The American Society of Heating Refrigeration and Air Conditioning Engineers (ASHRAE) recommends that residential structures be provided with active mechanical ventilation. Guidelines are set forth in ASHRAE Standard 62-2 2003 and are based on the size of the home and number of bedrooms. Although not currently required by code, mechanical fresh air ventilation is particularly important in today’s tighter homes to purge contaminants created by occupants, pets, cooking, etc. 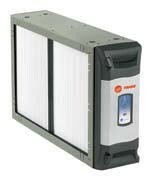 and is one of the three key elements for improved indoor air quality (humidity control, fresh air ventilation, filtration). High efficiency filtration can be counterproductive, however, if the duct system is not taken into account. For example, if a homeowner installs a pleated filter (readily available and marketed to improve air quality) at the return filter grille, but the duct system is in poor condition, air quality can, and usually does, go down. Reason: The air handler has to work much harder to pull air through a pleated filter – since air will take the path of least resistance, air is readily pulled into the duct system through leaks. If the duct system is located in an unconditioned attic, or worse, a crawl space, the amount of "bad" air being introduced into the house is increased. UV technology offers an additional defense against microbial contamination by irradiating the evaporator coil located within the air handling portion of an air conditioner. Constant irradiation of the evaporator coil significantly limits the propagation of microbial activity on the wet coil and surrounding cabinet resulting in a cleaner air handler and overall improved indoor air quality. Additional benefits are realized as the air is irradiated as it passes by the UV lamps. 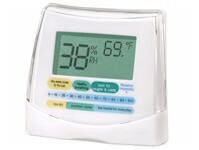 Controls for your interior environment control system can range from standard thermostats to programmable IAQ controls. IAQ controls can be effective in improving humidity levels even with standard air conditioning, but are particularly effective when combined with multi-stage compressor systems and/or whole house ventilating dehumidifiers. In addition to keeping your home energy efficient, various insulating strategies can directly impact your ability to aggressively maintain indoor air quality. 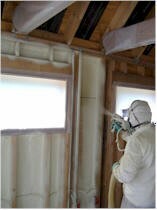 One of the most significant benefits of sprayed-on foam insulation is in the attic. By foaming the roof line in the attic, the "chimney" or "stack effect" commonly associated with ventilated attics is greatly reduced. By eliminating the stack effect, infiltration of warm, humid, unfiltered air into the home is significantly reduced. Spray foam insulation in the walls further reduces infiltration and provides for overall improved energy efficiency and comfort. Caution must be used, however, to ensure that adequate ventilation air is provided. Accordingly, many new or retrofit foam application also involve the installation of a fresh air make-up system. Bathroom exhaust fans are only effective at removing moisture if they are used. One of the biggest reasons given for why bathroom fans are not used is noise. In- line bathroom exhaust fans have drastically reduced the noise associated with bathroom fans and are, therefore, more likely to be used. Timers or other delay controls can be used to further maximize the removal of moisture and odors. The minimum efficiency for air conditioning systems is 14 SEER, however, higher efficiency systems are available. In addition to energy savings, higher efficiency equipment tends to be quieter and offer more options for improving indoor air quality such as improved humidity control. Constant Speed Air Handler / Single Stage Compressor Traditional (and the most commonly installed) residential and light commercial air conditioning consists of a single speed blower and single stage compressor. The system is typically designed to satisfy the interior design temperature on a design day. The addition of a variable speed air handler can significantly improve the performance of traditional air conditioning. Although the compressor is still single stage, part load performance (outside temperatures less than the design day) is improved since the air handler will run at a lower speed on its initial attempt to satisfy the thermostat and ramp up only if necessary. Accordingly, the fan running at lower speeds during these part load conditions improves the units ability to remove moisture (control humidity). Furthermore, and probably the biggest perceived benefit, is that the blower ramps up rather than starting at full speed, resulting in a quiet startup that often goes unnoticed. Multi-Stage compressors matched with variable speed air handlers have drastically improved the part-load performance and humidity control of residential air conditioning. It is like having two units in one. Since most of the time operating conditions are less than the design day, the multi-stage unit can more accurately match actual conditions by staging the compressor(s) and adjusting the variable speed air handler accordingly. The result is a highly efficient system with greatly improve part load moisture removal capabilities. VRV technology offers the most advanced system for residential and light commercial applications, providing variable capacity, advanced zoning and unmatched energy efficiency. The VRV system has a truly variable capacity at both the condensing and air handling units, thereby running at the exact capacity as required at any given time. This type of operation is inherently efficient and drastically increases moisture removal. Furthermore, temperature for the VRV system is sensed at the air handler’s return, allowing much more flexibility for controller location and enhanced temperature control. The VRV system has advanced zoning capabilities and enables multiple fan coils to run off of one condensing unit, containing an inverter "variable speed" compressor. The system basically has the ability to treat every room as a separate zone. Additionally, the condensing units for the VRV system are extremely quiet compared to standard air source equipment and the air handlers are specifically designed for quiet operation. If you need more information on Things to Consider When Selecting Your Environmental Control System, then please call GLS Engineering at 843-881-4803 or complete our online request form.